I was showing Con-Man the picture of him dressed up for Aunt Boo's wedding. He asked me if I would put it on a beer label, and I said "sure". Connor really likes the book "Stone Soup", and I've actually thought before that "Stone Soup" seems like a decent name for a beer. 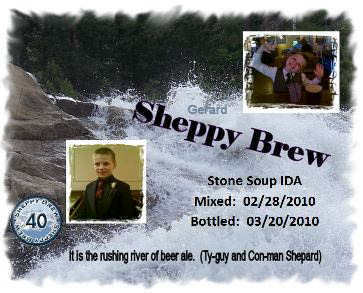 I decided that "his" beer should be called Stone Soup. Since Connor doesn't drink alcohol, creating something that would appeal to his tastes was not an issue. If you do not know the story (everyone knows the story ... don't they? ), Stone Soup starts up as a real simple recipe (3 stones and water). As villagers get excited, more and more people donate ingredients until it is a rich, complex, yummy meal for the whole town. 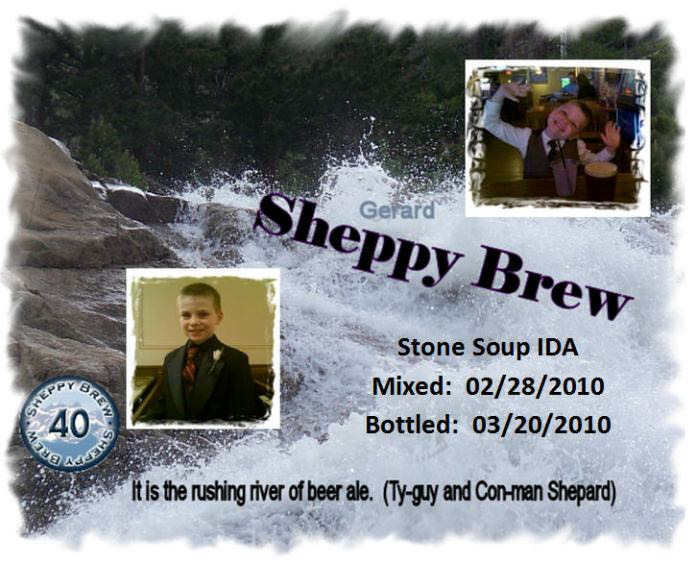 So, I figure Stone Soup would be a complex recipe with lots of different hops. Actually, if I had come up with the idea sooner, I probably would have given Tweedle Beetle Stout the name "Stone Soup", since I have declared that that beer is meant to use up partial packages of hops stored in my freezer. But, there is nothing saying I cannot have another beer recipe that does the same thing. Since Tweedle Beetle Stout is an Imperial stout, it seemed appropriate to make Stone Soup and imperial ale as well. I had recently listed to Jamil's Can You Brew It on Nogne 100 which Jamil had sort of a hard time describing the style. He ended up saying is was basically an "Imperial Red", which is not an official style, but was what Jamil thought would be appropriate for it. Basically, the Nogne 100 brewer on the show told Jamil that it was an IPA with black patent added just to darken it up. Since everyone on the show seemed to love the beer, I knew I would have to try the same technique sometime. Stone Soup seemed to be a perfect opportunity. IDA stands for Indian Dark Ale. I was going to follow Jamil's lead and call it Imperial Red Ale, but didn't want the initials to be IRA. When Tyler saw Connor's wedding picture on a label, Tyler wanted his too. The boys picked the background and made up the quote on the label themselves. The second batch of Stone Soup replaced the light LME with 2-row. I did keep the wheat LME in it. I also used more dark malts to bring the color up a bit. Stone soup's intense dry-hop flavor tastes to me like an IPA with a little extra something special that the chocolate and black malts bring through. It is one of those beers in which you cannot taste the alcohol, but which you can feel after the first glass. Wonderful beer. I have discussed this beer a few times on my blog. Follow this link to see those posts. Mash as instructed. Add all other sugars for 90 minute boil, making additions as instructed. Start fermentation in conditioning cooler at close to 60 for 24 hours. Then, let it naturally rise for 3 days. Stop cooling on day 4. Add dry hopping one week into fermentation. Use hop sacks .5oz per sack. Leave in for 7 days. Force carbonate in a keg to desired psi. Day 2: 64 - 66 going strong.